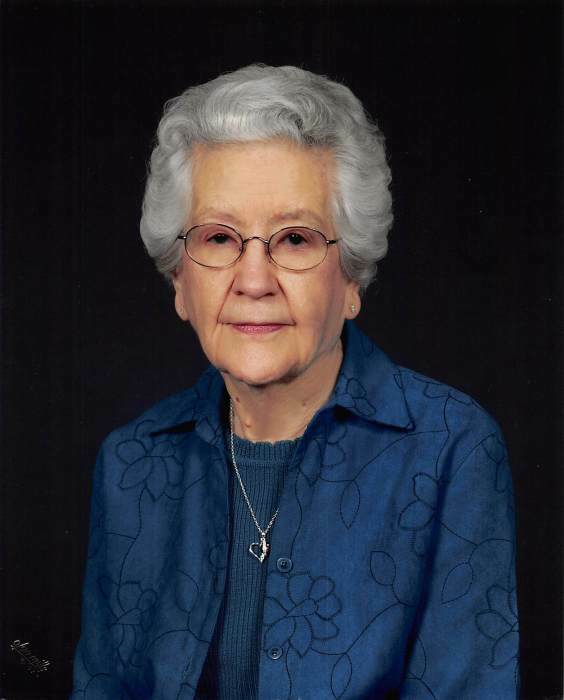 Marie L. Buri, age 97, of Milbank, SD, died August 22, 2018 at St. William's Care Center in Milbank. Services for Marie Buri are scheduled for Monday, August 27, 2018 at 10:30 a.m. at Central United Methodist Church in Milbank, SD. Rev. Thom Bowsher will officiate and interment will be in the Milbank City Cemetery. Visitation will be Sunday, August 26 from 5:00 – 7:00 p.m. at Mundwiler Funeral Home and continue one hour prior to the service at church. Marie Loretta Buri was born on July 10, 1921, to David and LuLu (Higgins) Lutz in Big Stone City, SD. She attended and graduated from Milbank High School in 1939. After school, she worked as a beautician in both Milbank and Watertown. Her longest employment was with JC Penney Catalog Department where she worked for many years. On February 5, 1943, Marie was united in marriage to James Buri in Tampa, FL. They lived in Tampa for a short time before Marie returned to Milbank in October of 1943. After returning from his service overseas, James and Marie moved to the family farm in 1949. After James passed away in 1984, Marie moved off the farm and to Milbank. Marie was very active in her church duties at Central United Methodist Church in Milbank. She taught Sunday School, was a member of the Ladies’ Aide group, and participated in Bible study. After her retirement in 1986, Marie enjoyed volunteer work, traveling, craft work, and being with family and friends. Marie was involved with the Pink Ladies and sewing club. She loved getting together with the other women and built strong lasting relationships with them. Marie moved to St. William’s Care Center in 2015, where she remained until her passing. She made friends with not only the residents but also the staff. Left to cherish her memory are her children: David (Monica) Buri of Nemo, SD and Cindy (Jim) Clark of Stevens Point, WI; four grandchildren: Christina (Paul) Keyes, Joshua (Tracy) Clark, Jessica (Dale) Daugherty, and Melissa (Corey) Holm; six great-grandchildren: Caleb Clark, Morgan Daugherty, Grayson Daugherty, Hayden Holm, Bentley Clark, and Hudson Holm; and many other relatives and friends. Preceding her in death are her parents; husband, James; two sisters; and one brother.